Figures 1a-c (left to right). Photos taken July 7 after the June 30 hail storm in northeast Nebraska. 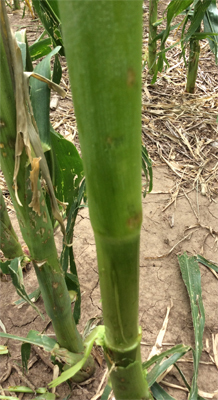 Pulling the corn stalk sheath back on badly bruised stalks (1a) reveals varying degree of damage (1b, 1c). Brown areas under the sheath indicate deeper damage. Q. How can I tell how badly damaged corn may be from bruising? A. Bruising is difficult to determine. You can make an initial assessment about a week to 10 days after the storm (Figure 1). Figure 2. 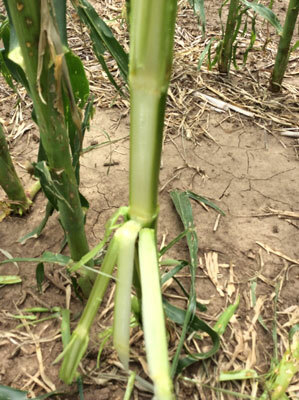 Cut the corn stalk vertically from node to node to help determine the extent of damage. Peel the sheaths away from the stalk and determine if the damage has actually penetrated the stalk (Figures 1b-c) The outer stalk (rind) is strong and can resist some damage. 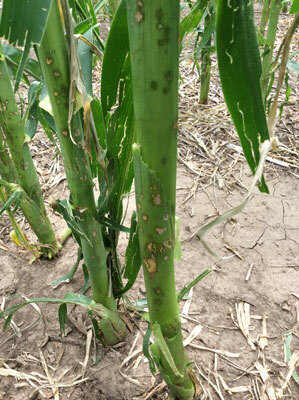 However, if the stalk has brown areas, that may indicate stand problems later in the season. 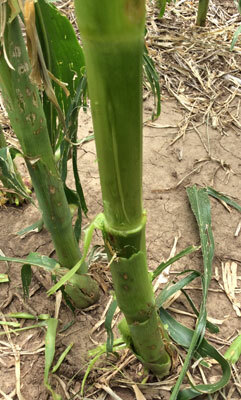 Cutting the stalk vertically from node to node will help determine the extent of damage (Figure 2). Brown areas in the pith where the hail hit indicate the potential for problems later in the season. The stalk in Figure 2 does not show any bruising from the pith. Bruised areas will disrupt the movement of fluids in the plant and reduce growth. Bruised plants that show stalk damage in the pith should probably be considered as missing plants. Consult a trained hail adjuster when making management decisions related to such hail-damaged fields.